Hindus believe that every aspect of life is sacred.That is why each significant stage, from conception to cremation, is celebrated as a reminder that life is a gift from God which should be duly respected and lived according to His wishes. 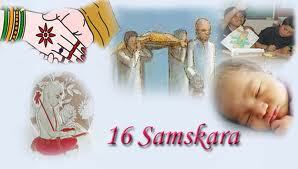 This is the first installment describing the significance of the 16 Samskaras. Since eternity man has strived to improve his own self. This realisation, unique only to mankind, has led him to think deeper about his physical, mental and spiritual well being. Towards this end, the Vedic seers prescribed a set of observances, known as Samskaras. (Though pronounced Sanskaras in Gujarati, we shall use the original Sanskrit form.) The nearest English word for samskara is sacrament, related to the phrase ‘rite of passage’. In the Oxford English Dictionary, sacrament is defined as a “religious ceremony or act regarded as an outward and visible sign of inward or spiritual grace.” In classical Sanskrit literature texts, such as Raghuvamsha, Kumarsambhava, Abhijnan -Shakuntal, Hitopadesha and Manu Smruti, samskara is used to mean: education, cultivation, training, refinement, perfection, grammatical purity, polishing, embellishment, decoration, a purificatory rite, a sacred rite, consecration, sanctification, effect of past actions (karmas), merit of karmas, etc. The variety of rites and rituals related to the samskar as help in the formation and development of personality. In the Parashar Smruti it is said, “Just as a picture is painted with various colors, so the character of a person is formed by undergoing various samskaras.” Thus, the Hindu sages realised the need of consciously guiding and molding the character of individuals, instead of letting them grow in a haphazard manner. In Gujarati this is known as Khodo bharavo. In this, the husband parts the wife’s hair. The religious significance of this samskara is to bring prosperity to the mother and long life to the unborn c hild. It also wards off evil influence. The physiological significance is interesting and advanced. Sushrut (Sharirsthan, Ch.33) believed that the foetus’s mind formed in the fifth month of pregnancy. Hence the mother is required to take the utmost care for delivering a healthy child. Stipulating the details, Sushrut enjoined the pregnant mother to avoid exertion of all kinds: refrain from sleeping during the day and keeping awake at night, and also avoid fear, purgatives, phlebotomy (blood letting by slicing veins) and postponing natural excretions. (Sharirsthan Ch.21). Besides samskaras which affect the physical health of the foetus, ancient scriptures contain examples of learning samskaras imprinted on it. From the Mahabharat, we know that Arjun’s son, A bhimanyu, learnt the secrets of battle strategy while in his mother’s, Subhadra’s, womb. The child – devotee Prahlad of the Shrimad Bhagvatam, learnt about the glory of Lord Narayan while in his mother’s, Kayadhu’s, womb. Just as a foetus can grasp good spiritual samskaras from the external world, the opposite is also true. It can definitely be affected by certain undesirable habits of the mother. Today we know that smoking, alcohol, certain medications and drugs have a detrimental effect on the foetus. The Varaha Smruti prohibits eating meat during pregnancy. Therefore, the Smrutis enjoined the husband to take every possible care to preserve the physical, mental and spiritual health of his pregnant wife. The Kalavidhan prohibits him from going abroad or to war, from building a new house and bathing in the sea. These rituals are performed at the birth of the child. It is believed that the moon has a special effect on the newly born. In addition, the constellation of the planets -nakshatras-also determine the degree of auspiciousness. If birth occurs during an inauspicious arrangement, the jatakarmas are performed to ward off their detrimental effects on the child. The father would also request the Brahmanishtha Satpurush for blessings. Based on the arrangement of the constellations at birth, the child is named on a day fixed by caste tradition. In the Hindu Dharma, the child is frequently named after an avatar, deity, sacred place or river, saint, etc., as a constant reminder of the sacred values for which that name represents. In the Swaminarayan Sampraday, the devotees approach Pramukh Swami Maharaj or the other senior sadhus to name their children. Feeding the child with solid food is the next important samskara. For a son this is done in even months -the 6th, 8th, 10th or 12th months. For a daughter this is done in odd months -5th, 7th or 9th months. The food offered is cooked rice with ghee. Some sutras advocate honey to be mixed with this. By advocating this samskara, the wise sages accomplished two important considerations. First, the child is weaned away from the mother at a proper time. Second, it warns the mother to stop breast feeding the child. For, an uninformed mother, many out of love, continue breast feeding the child, without realising that she was not doing much good to herself or the child. This samskara involves shaving the head (of a son) in the 1st, 2nd, 3rd or 5th year, or when initiating him with the janoi (Upanayan). According to Sushrut, the significance of this, together with nail cutting, is to give delight, lightness, prosperity,courage and happiness (Chikitsasthan. Ch. 24-72). Charak also voiced a similar opinion. In the Swaminarayan Sampraday, the son is first taken to Pramukh Swami Maharaj, or senior sadhus, who clip a tuft of hair. The remaining hair is shaved off shortly afterwards.A tuft of hair (shikha, chotli) is left in place at the top of the head for longevity. Sushrut points out its significance, “Inside the head, near the top, is the joint of a shira (artery) and a sandhi (critical juncture). There, in the eddy of hairs, is a vital spot called the adhipati (overlord). Any injury to this part causes sudden death” (Sharirsthan Ch. VI, 83). In the course of time, the shikha was regarded as a symbol of the Hindu Dharma and its removal came to be regarded as a grave sin (Laghu Harita IV). Ganesh, salutation to Sarasvati (goddess of knowledge), salutation to family deities and salutation to Narayan and Lakshmi.” The child then writes, “Aum Namah Siddham”. He then presents gifts to the acharya, such as a pagh and safo (head adornment of cloth). The acharya then blesses the child. At the age of eight the son is initiated by the acharya with the sacred thread, known as janoi or yagnopavit. Amongst all the foregoing samskaras this is regarded as supreme. It is the dawn of a new life, hence dvija-twice born. The child enters studentship and a life of perfect discipline which involves brahmacharya (celibacy). He leaves the guardianship of his parents to be looked after by the acharya. This samskara is performed by Brahmins, Kshatriyas and Vaishyas, for both boys and girls. Therefore, both the boy and girl received training in discipline, truthful living and physical service. During the course of time this samskara ceased to be given to girls, who thus failed to be formally educated. Today, the tradition of education underlying this samskara has died out. Upanayan only functions to bestow dvijatva to the son. Upa means ‘near.’ Nayan means ‘to take (him) to,’ i.e. to take the son to the teacher. Like the parents, the acharya will mold the student with love and patience into a man of character. He will inculcate in him the invaluable knowledge of the Vedas. This is the second meaning of Upanayan. Among all the cultural systems of the world, none have advocated such a lofty and stringent ideal for studentship than this Hindu samskara. If a student sincerely observes this samskara, he will turn into a successful scholar. Added to this, during this period, he receives from the acharya, a strong background for the householder’s life he will later enter. Today, it is obviously not feasible to stay at the acharya’s house. But the next best equivalent is to enter a chhatralay -boarding school. The discipline involved infuses in the student a fortitude generally not possible at home. Whereas students wear one janoi, householders could wear two; one for himself and one for his wife.The three strings of the janoi denote the three gunas -sattva (reality), rajas (passion), and tamas (darkness). They also remind the wearer that he has to pay off the three debts he owes to the seers, ancestors and gods. The three strings are tied by a knot known as the brahmagranthi which symbolises Brahma (creator), Vishnu (sustainer) and Shiva (leveller). One important significance of wearing the janoi is that the we arer would be constantly aware of the different deities which the threads represented. Therefore, he would be vigilant prior to any action not in accordance with the Dharma Shastras. This samskara was not mentioned in the earliest lists of the Dharma Sutras, which instead listed the four Vedic vows -Ved Vrats. It seemed that though upanayan marked the beginning of education, it did not coincide with Vedic study. Therefore a separate samskara was felt necessary to initiate Vedic study. In this samskara, each student, according to his lineage, masters his own branch of the Vedas. This samskara is included as one of the four Ved Vrats. When the other three faded, keshant itself became a separate samskara. ‘Kesh’ means hair and ‘ant’ means end. This samskara involves the first shaving of the beard by the student at the age of sixteen. It is also called Godaan because it involves gifting a cow to the acharya and gifts to the barber. Since the student now enters manhood he is required to be more vigilant over his impulses of youth. To remind him of his vow of brahmacharya, he is required to take the vow anew; to live in strict continence and austere discipline for one year. This samskara is performed at the end of the brahmacharya phase-the end of studentship. ‘Sama vartan’ meant ‘returning home from the house of the acharya.’ This involves a ritual sacrificial bath known as Awabhruth Snan. It is sacrificial because it marks the end of the long observance of brahmacharya. It is a ritual bath because it symbolises the crossing of the ocean of learning by the student -hence Vidyasnaatak -one who has crossed the ocean of learning. In Sanskrit literature, learning is compared to an ocean. Before the bath, the student has to obtain permission from the acharya to end his studentship and give him guru dakshina-tuition fees. Permission is necessary because it certifies the student as a person fit in learning, habit and character for a married life. Obviously the student is not in a position to pay fees. One Sutra describes the debt of the teacher as unpayable, “Even the earth containing the seven continents is not sufficient for the guru -dakshina.” But the formality is a required courtesy and the acharya says, “My child, enough with money. I am satisfied with thy merits.” He would elaborate with the impressive statements, known as Dikshant Pravachan, noted in the Taittiriya Upanishad (I.11). Those students who wished to remain as lifelong students observing brahmacharya would remain with the acharya. Today, this means accepting a spiritual guru -an Ekantik Satpurush and becoming a sadhu. The student thus bypasses the next two ashrams, to enter sannyas. rest, one should take sannyas in the fourth, casting away every worldly tie.” (Manu Smruti IV.1). By marriage an individual is able to achieve the four purusharths (endeavors) of life: dharma (righteousness), artha (wealth), kama (desire) and moksha (salvation). He is also able to pay off ancestral debt by having children. Procreation for children is also a primary purpose of marriage. In addition to being a religious sacrament, Hindu marriage is also regarded as an important social institution. For developing a stable and ideal society, marriage has been regarded as an essential element in all cultures of the world. A society without loyal marital ties tends to degrade. It is said that promiscuity was one reason for the downfall of the Romans. By marriage, both an individual and society, while remaining within the moral norms, can progress together. Simultaneously it does not cause harm to others nor infringe upon one’s independence. This samskara boosts cultural values and dharma. It upholds and promotes moral righteousness and self control. In the Hindu scriptures there are eight types mentioned. In the Manu Smruti (iii.21) they are divided into two groups: (i) the morally approved (prashasta) and (ii) the disapproved (aprashasta). This is the purest type. It was so called because it was thought fit for Brahmins. In this the girl is given by the father, with such ornaments that he can afford, to a man of character and learning, whom he has invited voluntarily and received respectfully, without taking anything in exchange (Manu Smruti, iii.17). The Smrutis consider this type as the most honorable, as it is free from physical force, lust, imposition of conditions and lure of money. Social decency and religious considerations are fully taken into account. This is the next type, inferior to the Braahm. In this, the girl is ornamented and given away by the father to a priest who officiates at a yagna (sacrifice). It is called Daiva since the gift is made on the occasion of a Daiva yagna. This method was prevalent among the first three Hindu classes. This type has faded, for it is considered improper to offer a girl to a priest. In this method the father of the bride received a pair or two of kine -a cow and an ox or two cows and two oxen-from the bridegroom for the purpose of a yagna which formed a part of a religious ritual. The pair of kine was not the bride’s price. This method was known as Aarsh because it was prevalent among the priestly families.Nonetheless, according to the Manu Smruti (iii.53) accepting a gift, small or large, amounts to a sale. This involves the father giving away his daughter to a suitor with the specific understanding that they both perform their civic and religious duties together. The name Prajapatya suggests that the couple enter the bond for discharging their duties to Prajapati i.e. for procreating and raising children. From the Western point of view this type of marriage may be regarded satisfactory because the rights of the husband and wife are equally well secured. But from the view of the Hindu shastras, it is inferior to the first three. This is because the daughter is given subject to mundane conditions. Hence the ‘gift’ cannot truly be regarded as free. As a point of interest, Kautilya in his Arthashastra prohibited divorce for the four Prashasta marriages.Now we shall consider the four types of marriage which are not approved by the scriptures. The Manu Smruti (iii.31) defines this as, “Where the husband having paid money to the relations of the bride and the bride herself, accepts her out of free will.” The main consideration in this kind of marriage is money and it is, in reality, a purchase. Manu condemns it, “The learned father of the girl should not accept even the least amount of price. Accepting the price out of greed, he becomes the seller of children.” (Manu Smruti, iii.51.) The Aitareya Brahmana (I.16) brands this type as pashuvivaha -animal marriage. Today this form of marriage is still prevalent in certain sections of Hindu society where a dowry is demanded by the bridegroom’s father from the bride’s father. Public opinion has begun to frown upon dowry. Religious and social leaders have been rallying against it. Pramukh Swami Maharaj has always condemned it. During the International Youth Festival at Vallabh Vidyanagar in 1990, he inspired 21,000 young men and women to take a vow of refusing dowry. To those who cannot afford the marriage costs, he arranges mass dowry -free marriages during grand festivals and yagnas. According to Manu, “Where the bride and bridegroom meet each other of their own accord and the union is consummated in passion, that form is called Gandharva.” (Manu Smruti, iii 32.) The name Gandharva is derived from a tribe of that name living in the Himalayas, in which it was a common occurrence. It was more prevalent among the Kshatriyas as they represented the freest element in society. The majority of the lawgivers discouraged it on religious and moral grounds. It was regarded as inferior to the first five forms because it was performed without sacred rituals and it originated from passion, a factor which seemed to be tenuous. Manu says, “Capture of a girl by force while she is crying, having killed, scattered and injured her relatives, is called Rakshas Vivaha.” (Manu Smruti, iii.21.) This usually occurred during war or political upheavals. The Kshatriyas usually practised this since they participated in war and obtained women as war booties. The word rakshas means demonic. This is the least approved. Manu (iii.34) defines this as, “Cohabiting with a girl in loneliness when she is sleepy, mad or intoxicated.” Obviously, this was the most uncivilize d and barbaric method. Paishach means ‘of witches’. goal, moksha, then ‘I’ and ‘you’ cease to exist. This is because ‘I’ and ‘you’ are empirically atma. And when ‘I ‘ and ‘you’ are believed to be atma, where is the conflict that would otherwise arise from selfish motives and desires? Therefore, in a Hindu marriage when conflicts and differences arise, they can be easily resolved. The couple consider each other as the atma, for the atma is pure, genderless, ageless, and inherently divine. Vivaha itself means ‘to lift, to support, to uphold, to sustain’. Admittedly, both spouses have to make sacrifices and efforts to imbibe this lofty philosophy. It is not an overnight process, more a lifelong, sacred commitment. It is this philosophy which has made the Vedic marriage a grand success for thousands of years. Only the recent rise in materialism, primarily based on superficial and mundane factors and body consciousness, have begun to ruin today’s Hindu marriages. The aforementioned sentiments, and a few others, are symbolically depicted and verbally emphasized by mantras chanted during the actual marriage ceremony, whose steps we consider next. On the day before the marriage, a creamy paste of turmeric and oil is smeared over the bride’s body. This is known as pithi cholvi in Gujarati and haridralepan in Sanskrit. The symbolic sentiment is that if the bride is of a dark complexion, this cosmetic treatment will endow her a lighter hue. Prior to the marriage ceremony, Ganapati (Ganesh) is worshipped at the bride’s home as an auspicious beginning of the rituals, since Ganapati is the deity of auspiciousness. The bridegroom is welcomed at the entrance of the bride’s house or marriage hall. The bride and the bridegroom place garlands over each other under the marriage canopy (mandap). A vow is then recited, “In following my duty, in our financial matters, in fulfilling my physical thirst, I will always consult you, take your consent and act upon it.” This is known as the Pratijna Svikar. The bride welcomes the bridegroom and gives him honey, yoghurt and ghee (clarified butter), suggesting that she will always please him with the sweetness of her behavior. There is also a sour tinge to the mixture, which symbolises the bitterness that life can sometimes bring. The parents of the bride proffer her hand to the bridegroom and request him to accept their daughter as his wife. The bridegroom accepts the bride as his wife and presents her with clothing and jewellery. The sacred fire is invoked and offerings are poured into it. Agni (fire) represents the mouth of Lord Vishnu and symbolises illumination of the mind, knowledge and happiness and Lord Vishnu serves as a divine witness. The bride places her right foot on a stone. The bridegroom tells her to be as firm as the stone in his house so that they are able to face problems with ease. Four offerings are made to the sacred fire. The brother of the bride places parched rice into the bride’s hands, half of which is meant to fall into the bridegroom’s hands. Mantras are chanted. The bride prays to Yama, the God of Death, that he grants long life, health, happiness and prosperity to the bridegroom. 1. Let us take this first step towards food and the necessities of life. 2. Let us take this second step towards strength and vigor. 3. Let us take this third step towards wealth and prosperity. 4. Let us take this fourth step towards obtaining happiness around the household. 5. Let us take this fifth step for progeny. 6. Let us take this sixth step to act according to the six seasons and time. 7. Let us take this seventh step to believe in the same religion and lifelong friendship. The bride and the bridegroom move around the sacred fire four times. On the first three rounds the bride leads the bridegroom and on the fourth the bridegroom leads the bride. Before each round an offering is made. This part of the ceremony is known as the mangal phera in Gujarati. The bridegroom blesses the bride by putting kumkum (vermillion powder) or sindur at the parting of her hair or on her forehead and by giving her a mangalsutra (sacred necklace). The bridegroom accepts the bride as his wife in the presence of the sun deity. If the marriage is performed at night, he tells her to look at the Dhruva star (star of steadfastness) and at the star of Arundhati (star of devotion). The bridegroom tells her to be firm in her love and duty, and to be devoted to him like Arundhati was to Sage Vashishtha. The bride tells the bridegroom that she will follow their example and remain devoted. The bridegroom and bride touch each other’s hearts. The bride tells the bridegroom, “I touch thy heart unto mine. God has given thee as my husband. May thy heart be mine now. When I talk to thee, please listen to me with perfect attention.” The bridegroom repeats the vow to the bride. After the final offering is made to the sacred fire, the priest blesses the bride and bridegroom. Flower petals and rice are distributed to the guests, who shower the bride and the bridegroom. With their blessings the marriage ceremony is completed.The bride and the bridegroom are no longer separate entities but an integrated personality who will share their lives in every way. In the Swaminarayan Sampraday there is a special ritual. Where possible the sadhus are called, who then do puja of the deceased with vermilion powder. A new kanthi and flower garlands are placed around the neck. The sadhus and the nearest relatives then do arti, followed by pradakshina. Everyone present chants the Swaminarayan mantra. The sadhus then leave after delivering a consolatory This rite performed by sadhus remains unique to the Swaminarayan Sampraday. It infuses spirit ual strength and thus considerably offsets the grief and hurt suffered by the relatives of the deceased.The family members then take the body to the cremation pyre, all the while chanting the Lord’s name. ‘Ram bolo bhai Ram’ is the most commonly uttered phrase. In Bengal it is ‘Hari bol, Hari bol.’ In the Swaminarayan Sampradaya the Swaminarayan dhun is chanted. After the body is laid on the funeral pyre, ghee is poured over it and the fire kindled by the nearest relative. Sesame seeds are also sprinkled onto the fire as a form of puja. The latter two steps are obviously not possible where an electric kiln is used for cremation. The fire lighted in the vivaha ceremony was later, by tradition, taken to the house and kept kindled in an altar throughout life. This signified that married life was to be lived through life’s vicissitudes, together. When one of the spouse died, the agni (fire) was taken in a crucible or pot to the crematorium, where it was used to light the pyre. This symbolized the end of vivaha and the beginning of agni (antyeshti) samskara. The rituals and observances which then follow vary in different groups and parts of Gujarat. By cremation, the body’s five basic components -known as panch bhuts -prithvi (earth), jal (water), tej (fire), vayu (wind) and akash (space) are returned to those of the universe, thus maintaining the cosmic equilibrium. All the samskaras are spiritually oriented. However, some directly benefit the environment in one way or another. Scientists in the past decade have begun to realize this. They have pointed out that cremation, for example, is the best, most effective and environmentally prudent method for disposing of the dead. Burial leads to enormous problems of space and groundwater contamination. Corpses infected with plague and slow virus diseases infect vectors which directly feed on them. This ultimately affects humans. Recently in England, the wisdom of cremating even diseased cattle has been realized, especially those afflicted with mad cow disease. Asthi San chayan After cremation, the ashes and residual bones (asthi) are collected in an urn. In some communities it is customary to wash them with milk and sanctified water. The urn is then taken to a sacred river such as Ganga, Narmada or to the sacred confluence of the three rivers Ganga, Yamuna and Saraswati in Allahabad, known as the Triveni Sangam. The Swaminarayan devotees also sprinkle the ashes in the sacred river Ghela, in Gadhada and the river Gondali in Gondal. During the ritual a Brahmin priest utters Vedic mantras and performs the final rites for the salvation of the deceased. The ashes are then sprinkled into the river.Sutak (Ashauch) -Impurity This is a period of ten to thirteen days during which the nearest family members do not perform their personal daily religious rituals such as puja, arti and thal. Their personal puja is given to a friend to perform on their behalf. The family members can visit the mandir for darshan. During this period, religious scriptures and devotional songs are recited and sung respectively, for the attainment of Akshardham by the deceased. On either the eleventh, twelfth or thirteenth day, the relatives offer thal (food) to the Lord in the local mandir to repay pitru (ancestral) debt. The general Hindu belief is that as soon as the soul leaves the body, it adopts another body whose limbs grow day by day. On the tenth day after death this ‘interim’ body grows completely. The son of the deceased offers the pindas -food balls made from wheat flour and water -to the growinglimbs, either day-to-day or all ten together on the tenth day. It is believed that, upto this day, the deceased still continues his relation with this world. Therefore the deceased is termed preta, which means one who has departed, but who has not yet reached the other world. On the eleventh day, Brahma, Vishnu, Rudra and Yama are invoked, with Vishnu as the special witness. In their presence the deceased is offered pindas. On the twelfth day the departed soul is given away to the other world, where he then resides with his forefathers. As soon as he reaches the other world he is released from his preta body. The relatives are then freed from the sutak and can then perform their daily puja. These rites are also samskaras on the soul to lead it to God. An associated rite after cremation, generally practiced in India, is for one or more male members of the deceased to shave their heads. This is rarely observed by Hindus abroad. Some communities eat only simple foods for a fixed number of days. Sajjaa In Gujarat the family members then perform the sajjaa ritual. In this, they offer a cow, a cot, utensils, food grains, a set of clothes and footwear and anything else that the deceased used to a Brahmin. The Brahmin performs a ritual and takes the objects, symbol ically to send them to the deceased for his use in the next world. In the Swaminarayan Sampradaya the belief is that the atma, who is then termed akshar mukta, is received by Shriji Maharaj, Gunatitanand Swami and Pramukh Swami Maharaj and taken to Akshard ham. Therefore, this akshar mukta does not need any material offerings in his next life. But if it is a family or caste tradition to perform the sajjaa, this can be done at the nearest mandir and the objects are offered to the Lord Himself. Another alternative which is becoming popular is the jivitkriya. It is the same as the sajjaa, except it is performed by a person while alive -as the name implies. During this ritual the central sentiment uttered is, “I am performing this ritual to please Bhagwan Swaminarayan and Pramukh Swami Maharaj.” The jivitkriya imbues a feeling of contentment in the individual since he/she witnesses it. their spiritual import, holistically ‘samskarize’ (edify) all aspects of an individual’s life. Since each samskara ritual makes the individual the focus of the occasion, he/she is psychologically boosted. This strengthens the individual’s self-esteem and enriches interaction with those around. The samskaras bring together family members, close relatives and friends, hence increase the cohesiveness of the family unit. Therein the unit harmonizes and strengthens the social structure. The consequence of this is a healthy society with a strong cultural identity which easily refines, boosts and perpetuates its traditional beliefs, customs, morals and values. This has been one of the key reasons for the Hindu Dharma withstanding the rigors and onslaughts of foreign incursions and upheavals through the ages.The ancient rishis and sages enjoined the sixteen samskaras for the eternal benefit of mankind through their direct experience with the Divine. They wove them as into the fabric of daily life of the Hindu. They are ‘outward acts,’ from pre-birth to post-death, for inward or spiritual grace. Today, the key samskara which will determine the cohesion and perpetuation of Hindu traditions anywhere in the world is vivaha, if observed sincerely with its pristine and lofty sentiments.